Designing a perfect roof has never been more challenging, but SIG Design and Technology have put together an 8 step guide to identify the challenges and ensure your design meets your clients requirements. 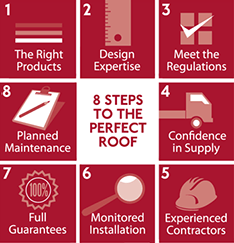 Here are our 8 steps to the #PerfectRoof. Click the links to find out why they matter and how you can tick them off your ToDo List. SIG Design & Technology offer a complete and impartial design and supply service which covers all eight steps to help our clients create the Perfect Roof. What is more, all of this expertise is just part of the service for us, provided free to our clients. We design flat roofs, green roofs, and zinc, copper and stainless steel roofing and cladding. Follow the steps to see how we can help at each stage.